The Lower Dnieper Offensive (also known as the "Battle of the Lower Dnieper") of took place in 1943 during the Second World War. It was one of the largest Second World War operations, involving almost 4,000,000 troops on both sides and stretching on a 1400 kilometers long front. 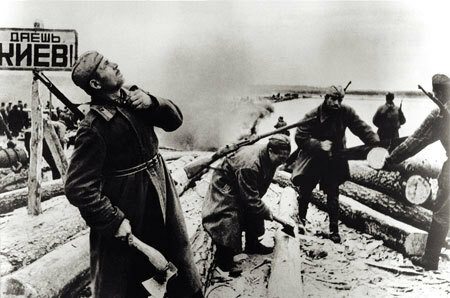 During this four-month operation, the eastern bank of the Dnieper was recovered from German forces by five of the Red Army's Fronts, which conducted several river assault crossings to establish several bridgeheads on the western bank. Subsequently, Kiev was liberated in a separate offensive. One of the costliest operations of the war, the casualties are estimated at being from 1,700,000 to 2,700,000 on both sides. The operation consisted of several smaller operational phases: Melitopol Offensive, Zaporozhye Offensive, Pyatikhatki Offensive, Znamenka Offensive and Dnepropetrovsk Offensive. 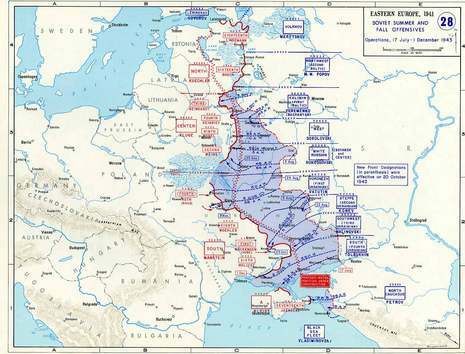 Having won on the defensive, the Soviets launched a series of counteroffensives that drove the Germans back past their July 4 positions and led to the liberation of Kharkov and an advance to the Dnieper River. Retreating, the Germans attempted to form a new line along the river, but were unable to hold it as the Soviets began crossing in numerous places.